Two Gray Hills is the fictitious Indian boarding school that Jim Chee attends. It is located near the Two Gray Hills trading post in the northwest corner of New Mexico on the Navajo Nation Reservation. Indian boarding schools often operated as missions; their main goal was to assimilate Native American children into what was understood as the dominant U.S. culture via conversion to Christianity, loss of indigenous language and lifeways, and training in service work. Physical, sexual, and psychological abuse were common at boarding schools. 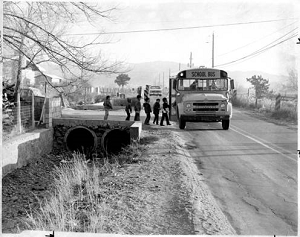 "Students boarding school bus on Agua Fria Street, Santa Fe, New Mexico, 1978," photograph, The Santa Fe New Mexicn Collection (HP.2014.14.427). Use with permission only. 2014, The Boarding School Experience. accessed March 26, 2015, inaccessible January 26, 2018. 2013, Examining lessons learned from the past as American Indian resilience reinvents tribes.